The Arabic kaffiyeh or shemagh scarf has always been popular in the Middle East but rose to prominence in the United States in the past few seasons. These are colorful and easy-to-wear accessories that drape around the neck, on the head or over the face. 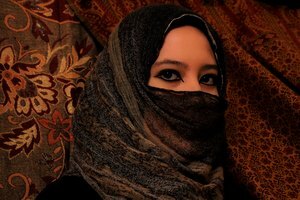 For this tutorial, the focus is the shemagh as neck scarf, which is great for sun protection or fashion accent. Fold the shemagh scarf in half. It doesn't need to be perfect or crisp; in fact, kaffiyehs are made to drape loosely. Lay the scarf across the back of the neck, letting the ends hang in front. One end should be slightly lower than the other. Take the shorter end and wind it around the neck. Keep it very loose and make sure that the scarf drapes casually. Tuck the end under the lower edge of the scarf. Take the remaining end and wind it in front of the neck, once again keeping it loose. Tuck that end underneath. Arrange the drapes to suit. Fold the scarf in half loosely, or to a thickness that's comfortable under the chin. Hold the scarf so that the middle is in front of the neck, under the chin. Grasp the two ends. Take one end and wind it around the back of the neck, draping the loose end over the shoulder to hang loose. Make certain that the scarf drapes loosely. Wind the other end in the opposite direction, draping the remaining end over the empty shoulder. Adjust the drape to suit. Fold the scarf along the diagonal, leaving the scarf in a triangle. Roll the longer edge of the triangle until the remainder can fit easily under the chin along the neck. Keep it hanging loose. Hold the scarf against the neck, point down. Leave it slack and relaxed. Wind the ends around the neck underneath the fabric point. Tie the ends and tuck in the back, fluffing out the fullness of the scarf in front. Purchase a scarf size according to personal taste. Bigger scarves will hang fuller than small ones.